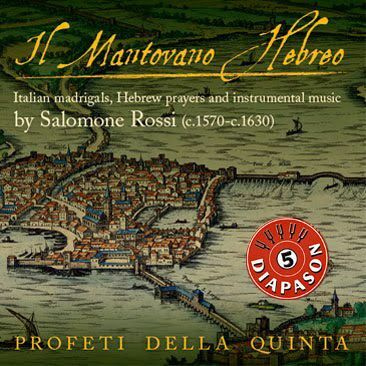 The programme portrays Salomone Rossi's many-faceted art as a court composer in the service of the Gonzaga family and as a unique innovator of devotional music for the synagogue, by presenting a selection of his Italian madrigals, instrumental pieces, and Hebrew prayers. "This ensemble manages to convince you from the first note on, they are five singers who seem to breathe through one mouth. Also the instrumentalists are of great quality. Last year Profeti della Quinta did a concert tour in Holland with this program, and the very concentrated atmosphere that was present in the concerts is effortlessly transmitted to the CD. This is really very special." The album was named under "Hidden gems of 2013": "...This expertly performed collection of Italian madrigals, Hebrew prayers and instrumental music deserves recognition as a hidden gem." Best of the Year 2013! Bassus, Cembalo & musical direction - Elam Rotem.